Before you start work, you can customise your character. The customisation options for your avatar may not be as sophisticated as those in Sims, but you can pick your character’s gender, skin colour, clothing and general hair and face features. Congrats, you work in Walmart’s dry grocery department! Say hello to your boss Cynthia, who will be looking over your shoulder the entire game. Like any good boss, Cynthia will be there throughout your workday to provide feedback and criticism. She also introduces you to a bunch of complicated acronyms about customer satisfaction, sales and shelf stocks, which are used to measure your success and guide you through your tasks. I forgot what Cynthia told me almost as soon as I started to play. You can pick up on the general idea of the terms as you play, although I can’t guarantee you’ll ever fully understand what’s being measured and how you’re evaluated. 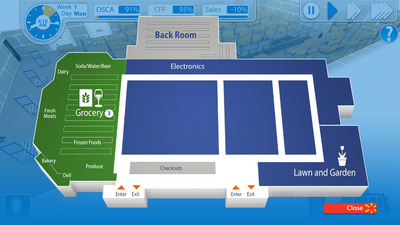 You’re provided with this handy (and useless) floor plan that shows the layout of the store. You use the map, which sits in the corner of your screen, to switch between the places you need to perform tasks. You start each day in the back room, where you have to complete all your work before you can move into your assigned department. 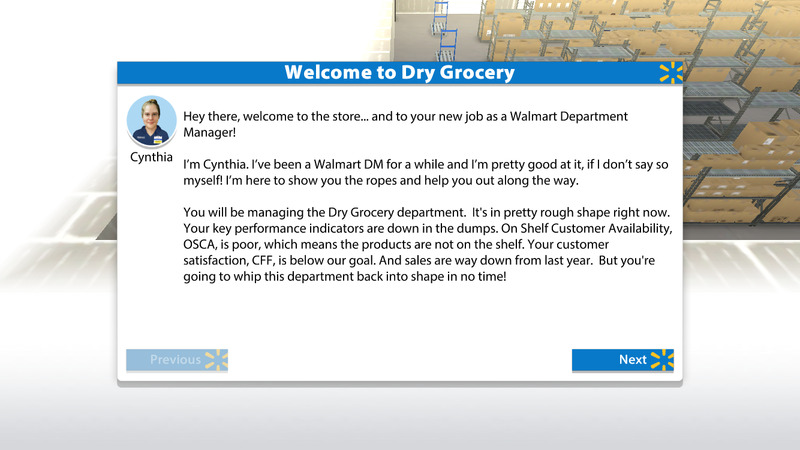 I played through five workdays in the game, and in that time, the only locations that I needed to toggle between were the back room and the grocery section – so the floor plan seems kind of unnecessary. Walmart’s spokesperson says that developers are in the process of adding a new level to the game that would take place in the “lawn and garden” section of the store. 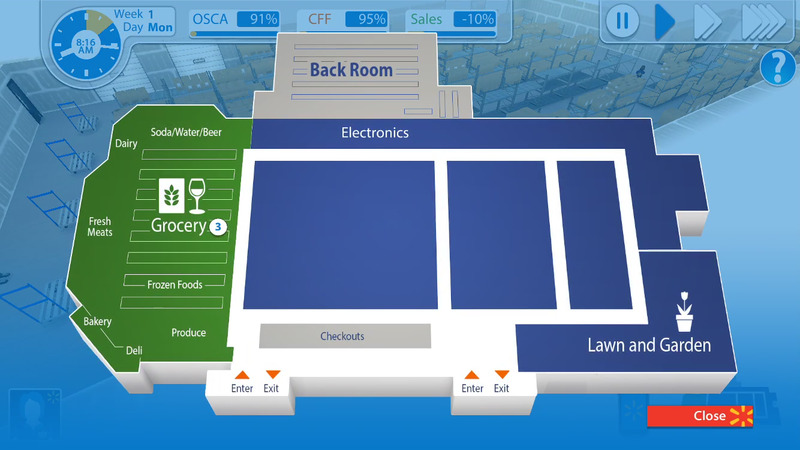 If they really want to put the floor plan to good use though, Walmart’s developers should consider adding a “Battle Royale” mode. Each work day is started with a “Walmart Cheer” which is actually a real thing that Walmart employees do. This is an actual thing that Walmart employees do – you can find numerous videos of the “Walmart Cheer” on YouTube and social media. So, just like real Walmart employee, you and your coworkers start out every work day in Spark City by gathering in a circle in the back room and clapping. In the back room, you’ll check inventory and stock items. But it’s pretty unclear what the right choice is, and there’s also some convoluted maths involved. By the end of the work week, I still couldn’t figure out what I did to get a positive reaction. Your success in the game in monitored by these metrics, which will float up above your avatar in green (good!) or red (bad!) after every task you complete. If you do something wrong enough times, your boss Cynthia will pop up with some advice, including a maths equation that you’re supposed to use to make your decisions in the back room. I ended up making up my strategy as I went, and must have done OK because I kept my job. You then move to the store floor, where you greet customers, restock shelves and adjust prices. 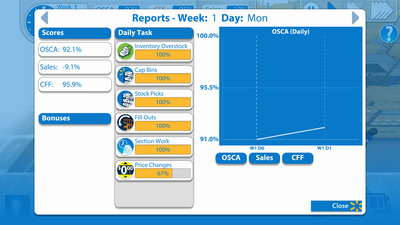 After you complete your work downstairs, you move to the store floor and click through the tasks that pop up. Once in a while there’s an alert that pops up with a random task to do from your manager. It’s pretty similar to the work in the back room: it’s confusing what you’re supposed to do as you run around the store, but that is the life of a retail worker. Once in a while there’s an emergency, and you have to fend for yourself to figure out what to do. I didn’t pick the right choice when there was a spill on the floor, and a customer fell in it. I apparently chose wrong by deciding to clean up the spill myself. While my character was walking to get the cleaning supplies, the game actually shows a customer fall in the puddle. It’s all good, I talked to the guy and still kept my job. During my work week, the only emergency alerts I got were spills I had to clean up and, once, a potential shoplifter I had to monitor. You get a report card at the end of each day telling you had you did. I’m not going to lie, I got some joy seeing what I accomplished in the game. My progress report was generally better each day, so I’ll take that as a sign that I could hold my own as a Walmart manager. The game as it stands is pretty simple. 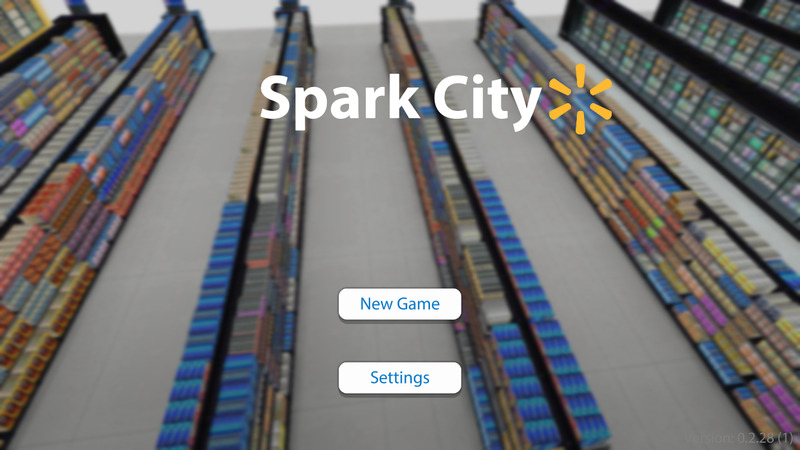 Walmart says that it will be adding new levels and features as soon as next month, because the app is still primarily a tool for training its employees.